Actress Noel Neill has died at the age of 95. The first live-action Lois Lane, Neill is most widely known for starring in the syndicated Adventures of Superman TV show opposite George Reeves as Superman and alter-ego, Clark Kent. Neill was a recast on the super-hero action series, replacing Phyllis Coates, who played the ace reporter in the 1951 feature film, Superman and the Mole Men. In first run, Adventures of Superman premiered in 1952 and ran through 1958, with Neil joining in 1953. The Adventures of Superman TV series cast also includes: John Hamilton, Bill Kennedy, Jack Larson (pictured above with Neill in 2006), and Robert Shayne. Primarily working in film, Neill’s other TV series work includes spots on Superboy (1991), Public Defender (1964), Racket Squad (1952), Fireside Theatre (1951), The Lone Ranger (1951), and The Cisco Kid (1950). Neill first assumed the Lois Lane role in Columbia’s serial, Atom Man vs. Superman, opposite Kirk Alyn’s Superman/Clark Kent, which predates the Adventures of Superman TV show. Editor Jim Nolt broke the news on Facebook, posting a message from Larry Ward, whom EW reports is Neill’s official biographer. 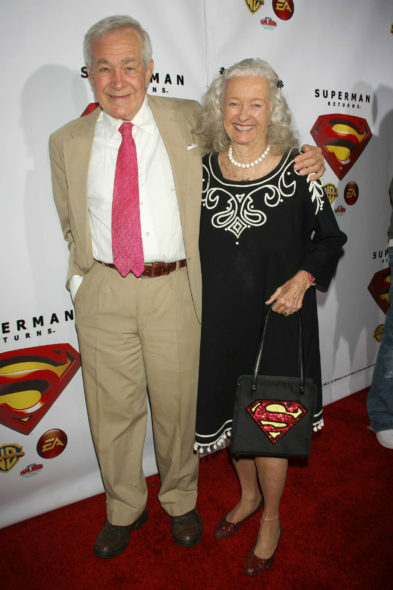 My dear friend Noel Neill, Lois Lane to George Reeves's Superman in the 1950s, has died at 95. Rest in peace, dear girl. According to a Deadline report, Ms. Neill, “…had been in ill health since suffering a broken hip in 2010.” Watch this montage of Noel Neill as Lois Lane on the Adventures of Superman TV show. We invite you to share your memories of Ms. Neill and her work, below. Underdog: What Do the Series Creators Think About the Movie?